On June 6th, 1815, a group of eleven men met, for the purpose of incorporating St. James Parish. On the 10th of April, 1816, ground was broken for the first St. James red brick Church on Ellicott Street. Taking six years to complete, the walls were three feet thick with tall deeply recessed Gothic windows in the Nave. The Church was consecrated on Friday, September 22, 1826. By 1833, the life of the brick Church was fading. The hurried and unstudied construction made repair expenses increasingly excessive with each passing year. A new stone Church was erected on the same site in 1836. This new Church was built in part with the resources from the old church with enough brick left over to build a parsonage next to the Church. This parsonage was the Rector's home for almost 70 years until 1904. The building is still in use as offices, and is located on Ellicott Street. This Church was consecrated on September 11, 1836. Due to faulty materials and inadequately supported beam construction, the six year old roof and ceiling were replaced at great expense and trouble. By 1904 the stone Church was deteriorating quickly. We are the People of St. James and this is Our History. The cornerstone of the new St. James Church building on East Main Street, the residential heart of the city, was dedicated on April 10, 1908. A bequest by Adelaide Richmond Kenny made the move possible. The barn on the property was sold, the land rented and the lumber from the house was saved for building purposes. Only the iron fence was left and is still standing along Main Street. As the building progressed, windows were transferred from the old church along with choir stalls, organ, chancel rail, lectern, tabernacle, Bishop's chair, litany desk and candelabras. Mr. George Rupprecht donated a new chancel window. 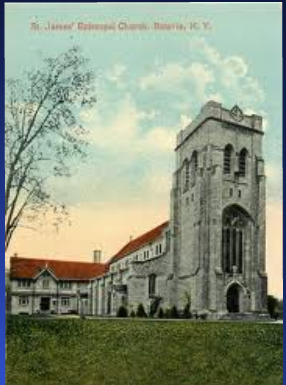 The old Troy bell now hung in a truly English belfry and first chimed the call to worship in the fall of 1909. The new rectory was completed in 1930. The massive bell tower is an excellent composite of the elements of English towers. St. James has completely opened the tower on the inside to be part of the nave. The large stained glass window in the front of the tower is very rich in color and adds warmth to the building. A comprehensive history of St. James was written in 1965. Just click on the title to read this account of historical events.